George Wright, the most famous theatre organist of the modern era, died of heart failure May 10 at Glendale Memorial Hospital near his home in the Hollywood hills. He was 77. Best known for his virtuoso performances on the huge Wurlitzer theater pipe organs at the famed San Francisco Fox Theater and the ornate Paramount Theaters in both New York and Oakland, Wright was in constant demand playing at concerts around the world. He recorded more than 60 albums, some of which sold over a million copies during the 1950s and 1960s. Born in Orland in the Sacramento Valley in 1920, Wright learned to play the piano as a child from his mother, who was a private music teacher. He grew up in Stockton and Sacramento, where he graduated from Grant Union High School. His first professional engagement was at the Shanghai Terrace Bowl, a Chinese nightclub in Oakland that boasted a two-manual, six-rank Wurlitzer. The show was broadcast nightly by an Oakland radio station. In 1941, he joined San Francisco radio station KFRC and performed at the Fox Theater on Saturday nights. In 1944, he relocated to New York City, where he played on Jack Berch's NBC show and later guested with Paul Whiteman and Percy Faith and on the network shows of Bing Crosby and Perry Como. He also conducted his own orchestra on the Robert Q. Lewis show and began a seven-year stint playing in a trio with Charles Magnante, accordionist, and Tony Mottola, guitarist, for an NBC show sponsored by the Prudential Insurance Company. In 1949, he signed on as house organist for the Paramount Theater in New York. In 1951 he returned to California as ABC's musical director for the West Coast and live studio organist for the long-running TV program, General Hospital. In 1995, he won the first lifetime achievement award from the American Theatre Organ Society. 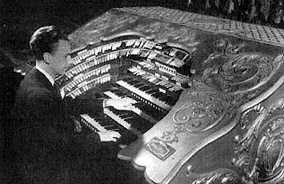 Wright owned a Mighty Wurlitzer theater pipe organ which was installed in his home in the Hollywood hills and played until just a few days before he died. He finished his last album, Salon, just 60 days before his death. Simon Gledhill, a writer for a British music magazine and an organist himself, said on learning of Wright's death: "With the passing of The Living Legend of the Theater Organ, a significant — perhaps the significant — chapter in the history of the theater pipe organ and its music has drawn to a close. Imitated by many, equaled by none, he was indeed a legendary figure, whose profound and far-reaching influence on current perceptions of what constitutes good theater organ cannot be overstated. He redefined the standards by which performances in this genre are judged, creating a new quality scale on which he immediately assumed and (in the minds of most) retained the top position."